Oil on canvas, 107 x 163 cm. 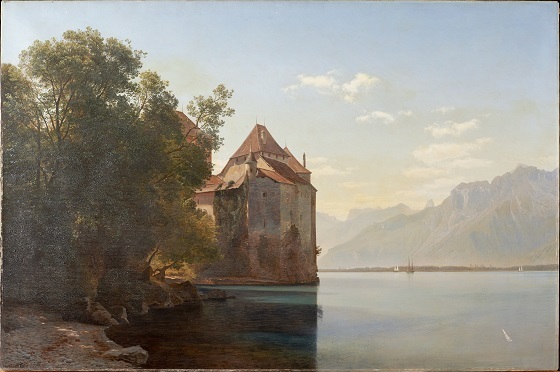 This Swiss landscape painting by Janus la Cour is characterised by its undisturbed silence. The image is inspired by a trip the artist took to Lake Geneva one early September morning. On a rocky island in the lake the back of the medieval Chillon Castle can be seen, while on the horizon, rock formations can be glimpsed through the dense morning fog. The deserted landscape shows that the artist was not interested in depicting people, instead preferring to focus on the diverse and exotic facets of nature. The deep and warm colours of the vegetation in the foreground stands in sharp contrast to the almost transparent palette of colours used to paint the water and snow-capped mountains on the horizon. Janus la Cour’s encounter with the nature of Switzerland became an eye-opening experience for the artist. During his stay, he wrote enthusiastically about the wondrous cloud formations, imposing mountains and peaceful valleys.